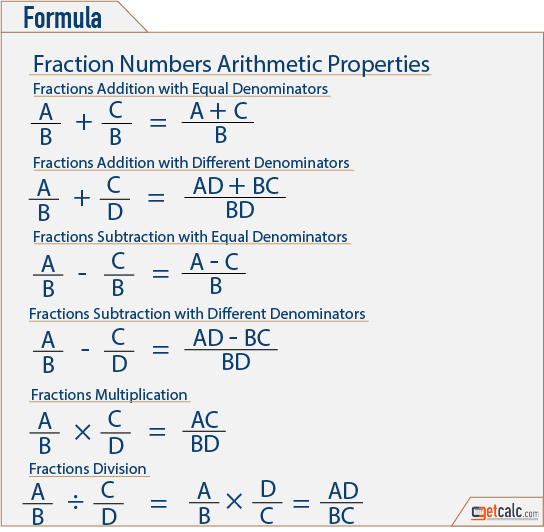 getcalc.com's two fractions subtraction calculator is an online basic math function tool to find equivalent fraction from difference between two fractional numbers with same or different (equal or unlike) denominators. Elementary or grade school students may efficiently solve or practice the worksheet problems or homework for subtraction between two fraction numbers by using this calculator, formula & step by step calculation. Similarly, teachers or parents also use this calculator & associated information to create worksheet, homework or practice problems to find the difference between the fractions. what is 1/2 - 1/8? what is 1/2 minus 1/3? what is the difference between 7/8 & 1/4? how to subtract whole number 1/2 from 2/3? what is 3/8 - 2/3? what is 3/4 minus 5/8? what is the difference between 1/4 & 1/8? what is 11/6 subtracted from 7/9? The below solved example with step by step calculation shows how to find the difference between two fractions with different or unlike denominators by subtracting one from another. Find what is the equivalent fraction by subtracting 3/4 from 5/6 (with unequal or different denominators). step 3 To have common denominator, multiply LCM 12 with all numerators & denominators. step 4 Find the difference between the numerators and rewrite it in a single form. Thus, 1/12 is the difference by subtracting 3/4 from 5/6. The below solved example with step by step calculation shows how to find the difference between two fractions with same, equal or common denominators by subtracting one from another. Find what is the equivalent fraction by subtracting 3/7 from 5/7 (with same, equal or common denominators). 3/7 - 5/7 = ? Thus, -2/7 is the equivalent fraction by subtracting 5/7 from 3/7. Fraction Subtraction is a basic arithmetic operation used to find the difference between two or more fractions. It's a part of most important elementary school mathematics. For same or common denominator, the fraction subtraction is the difference between both numerators divided by the common denominator. For unlike, unequal or different denominators, the function LCM (least common multiple) is used to convert the fractions to have the common denominators to perform subtraction between the fractions.